With so many different varieties and flavours, mushrooms are a great source of nutrients than can be served in creative ways. Among the many health benefits they offer you will find they help reduce blood pressure, improve your immune system and cardiovascular system. There’s a reason why they have been central to good health in Asia for thousands of year. Mushrooms can also stimulate the absorption of iron and improve bone health. Rich in nutrients, minerals and proteins and low in carbohydrates and calories, fungi are a superfood packed with health inducing properties. They can help with weight loss and be an amazing substitute for meat, much like beans and grains. With so many different types to chose from there are specific benefits to be found in each of them but be sure to only consume the ones made available at trusted stores and markets as there are also plenty of dangerous varieties. Whatever your favourite - crimini, enoki, oyster, portobello, shiitake or white button - all mushrooms are loaded with essential nutrients. Mushrooms increase your Vitamin D, and are the only fruit or vegetable source of this critical vitamin. Like humans, mushrooms produce vitamin D when in sunlight. Mushrooms have high levels of selenium, riboflavin (vitamin B2), pantothenic acid (vitamin B5), copper, niacin (vitamin B3), potassium and phosphorus. Mushrooms are a very good substitute when coming off a diet heavy in meat, - they aid in reducing the toxicity resulting of over consumption of meat. Long-term vegans should use mushrooms sparingly unless a specific mushroom is needed for treating a disease process. Consumption of mushrooms can be too cleansing during convalescence. To store: Prepackaged mushrooms should stay in the package, but loose mushrooms or those in an open package should be stored in a paper bag in the refrigerator. This allows them to breathe so they stay firm longer. Storing mushrooms in a plastic bag causes them to deteriorate quickly. To clean: Clean the mushrooms using as little water as possible, because washing mushrooms causes them to absorb water & dilutes the flavour. The best way to clean fresh mushrooms is to wipe them with a clean, barely damp cloth or paper towel. Now that you are fully informed, it is time to get the maximum benefit and enjoy the great flavor of mushrooms. For that we have selected this delicious, crunchy and intense mushroom pastie by Stacey from goodnessis.com. 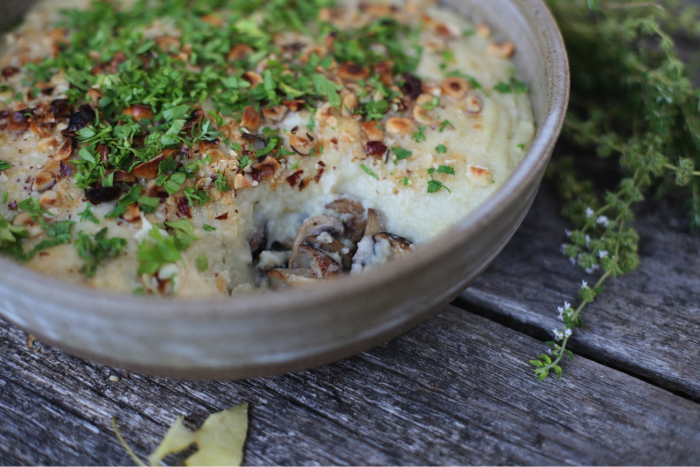 The hearty rich flavours of wild mushrooms sautéed in ghee are perfect in giving a lift to a comforting mash, and then topping it off with roasted hazelnut and melted cheese with loads of parsley is divine. Use any mushrooms: mixed wild mushrooms, porcini, enoki, oyster, chanterella or even plain little brown ones. To keep this dish vegan use oil instead of ghee and replace the Parmesan with this ‘pine nut parmesan’. Pre–heat the oven to 180/350F. Prepare the hazelnuts by spreading them out on a baking tray and bake for 8 minutes. While they are still warm, rub the nuts in a towel to remove the skins. Inevitably there will be some skins that refuse to peel away, but no matter. Roughly chop & set aside. Drain and rinse the millet. Place in a medium saucepan, add the cauliflower, and water. Bring to a boil over high heat. Cover pot, reduce heat to low, and simmer for 25 minutes or until millet is soft, fluffy and most of the liquid has absorbed. While waiting for the millet to cook, prepare the mushrooms as outlined below. When the millet has finished cooking, remove from heat and set aside for 10 minutes. Add the ghee, salt and pepper and mash with a potato masher until creamy, or puree the mixture using an immersion hand blender/food processor for a more creamy consistency. Clean the mushrooms and roughly tear or slice the mushrooms in irregular pieces, removing the harder end of the stem. Heat 2 Tblsp spoons ghee/coconut oil in a large frying pan over medium-high heat. Once hot add half of the mushrooms and fry for a few minutes, or until just cooked; try not to move them much so you get golden-brown patches on their surface. Remove from pan, and repeat with the rest of the mushrooms and ghee/oil. Turn off the heat; add salt & pepper, and a sprinkling of thyme. Spoon into a round ovenproof dish. Cover with foil and place in a warm oven until ready. Remove the mushrooms from the oven and spread the millet mash evenly over the mushrooms, sprinkle over the Parmesan and hazelnuts. Place under the grill/broiler until the cheese bubbles and browns. Garnish with parsley & thyme, and an extra sprinkle of salt & pepper. Serve with a bitter, green salad, dressed with a sweet mustard dressing.